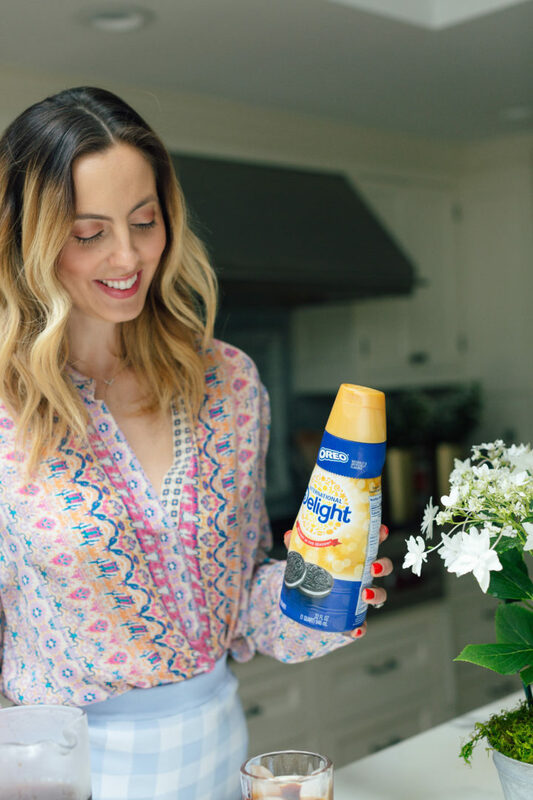 **Many thanks to International Delight for sending me the new International Delight OREO® Cookie Flavored Creamer to try and for sponsoring this post! As always the thoughts and opinions expressed below are entirely my own. Summer is the most fun time of year, but also the most hectic. As a busy mom, I can get burnt out by the end of Summer! 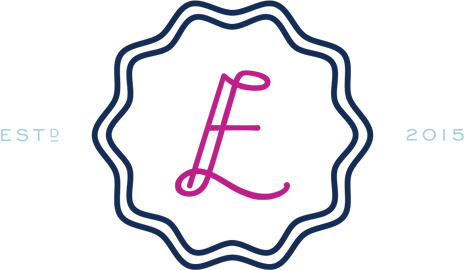 There has been so much travel for us as a family the past few months, and between packing, unpacking, hosting, and trying to wrangle my children in to being good houseguests, my energy levels have been bottomed out recently. 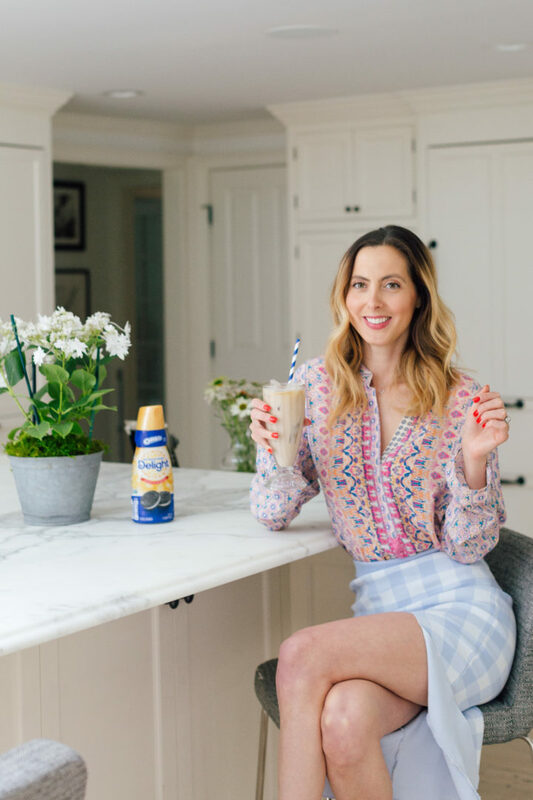 These days I’ve been focusing on some simple ways to have some “Me Time” and recharge. Sometimes all you need is a commitment to create a daily moment for yourself to regroup! 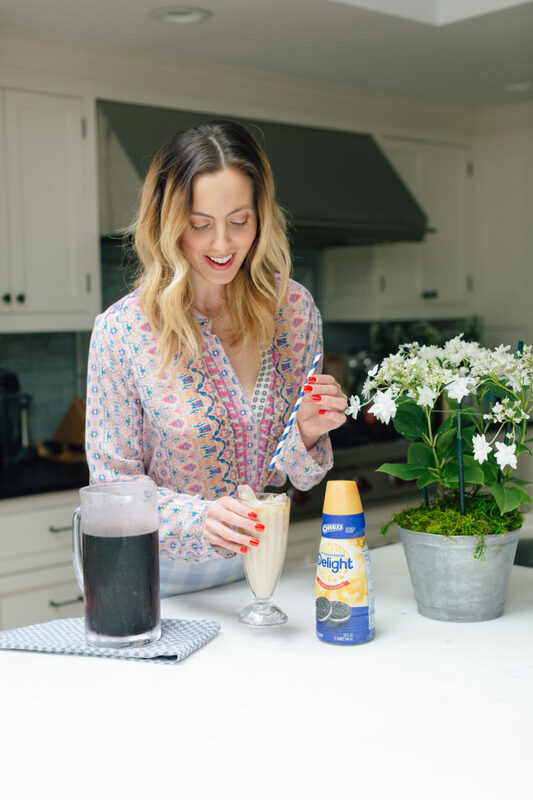 My favorite “Me Time” moment of indulgence recently has been to make myself a little iced coffee break with the new International Delight OREO® cookie flavored creamer! A little backstory: OREO® cookies have always been one of my favorite dairy-free treats from growing up. I can’t have lactose, and guess what readily available and delicious cookie has no lactose? OREO® cookies! They give me that warm and fuzzy feeling, what can I say. 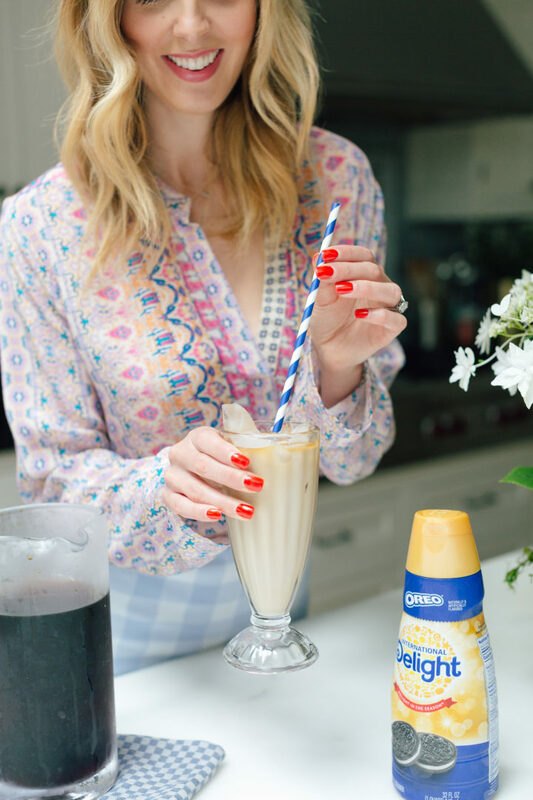 And now this brand new International Delight OREO® cookie flavored creamer is lactose free for my adult phase of life, and those little moments when I need to recharge. 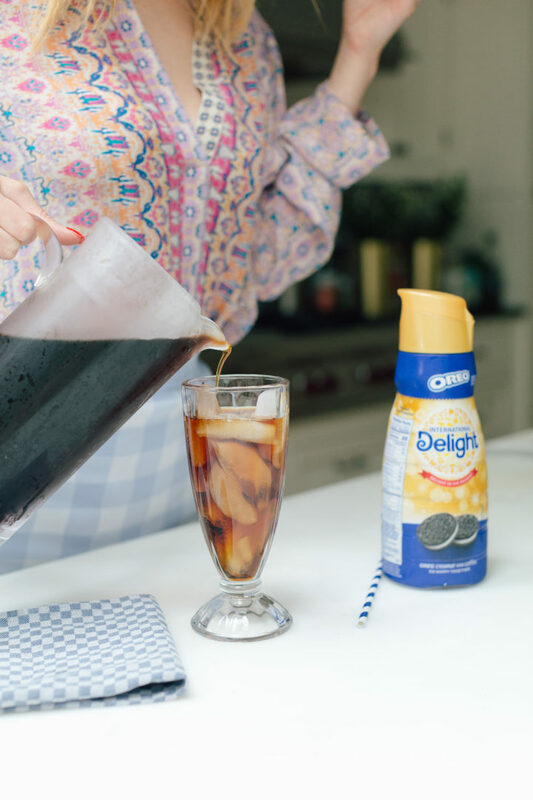 The creamer takes the fan favorite taste of OREO® cookies, and pairs it with the smooth and delish taste of International Delight creamer for the yummiest combo. 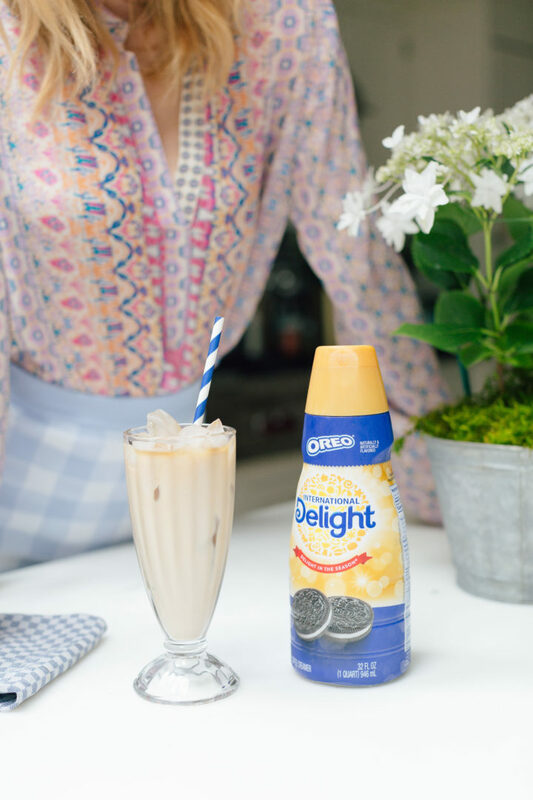 Once a day, usually in the afternoon, I’ll make myself a tall glass of iced coffee, and pour in the International Delight OREO® cookie flavored creamer. Then I find a quiet spot and sit down to sip and indulge! It tastes so insanely delicious– exactly like OREO cookies! Taking a brief pause and treating myself really does help me set the tone for the rest of the day. There are a couple other methods I use to find moments for myself during hectic days. Instead of drinking plain, boring water, treat yourself to some DIY spa water! Just add sliced up fruit or veggies to a pitcher of filtered water and stick it in the fridge for some fancy hydration. I also like to treat myself while I get dinner on the table! You can whip up a super easy and nourishing DIY face mask and put it on while you cook. Simply wipe the face mask off with a damp towel before sitting down to dinner totally refreshed. Investing a few brief but sweet moments in myself really helps me de-stress and keep a sunny outlook during my most hectic days! Do you have any tried and true methods for creating “Me Time” during the day? Hi there! I agree, it is SO important , no matter what stage of life we are in, to take a break and have me time!!!!!! 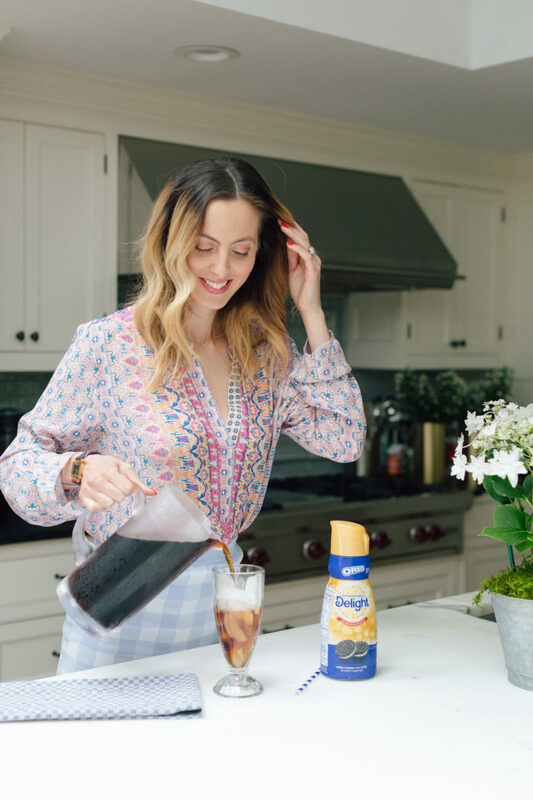 Loved this post because I’m literally obsessed with iced coffee ! Can’t wait to try this creamer! 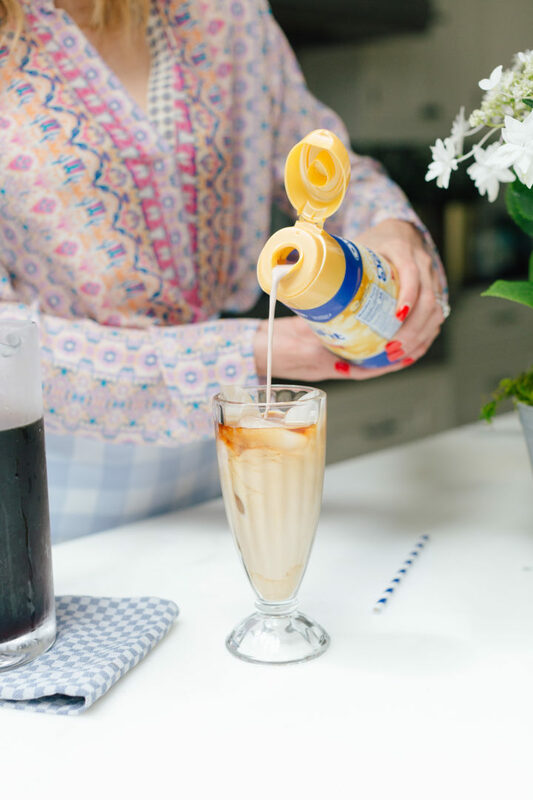 What iced coffee do you use ? And is it easy to make? Yay! I think you’ll love it if you love Oreo cookies! (it tastes EXACTLY like them, so yummy). I use the Dunkin Donuts Ice coffee cold brew packets that you make in the fridge with a pitcher of water. So great and it lasts us a couple days per pitcher!